Suitable for all ages of slide lovers! This playground was upgraded towards the end of 2016 with new equipment going in. Slides still feature with 3 reasonably long tunnel slides stretching down the side of the hill. But in addition to slides, there are also swings, including a bucket swing, a seasaw, ropes for climbing along, a flying fox and in-ground mini trampolines. There are a few trees for climbing, a large grassy area for ball games and running around and toilets right next to the equipment. If you use the Ponsonby Rd/Hopetoun entrances there’s a nice downhill walk through native bush on marked paths to get there. But be warned, if you’re returning the same way, don’t forget it’ll be all uphill on the way back! This can be a great stopping point if you’re trying to walk between Ponsonby and central Auckland. Address: there are lots of entrances to this playground. 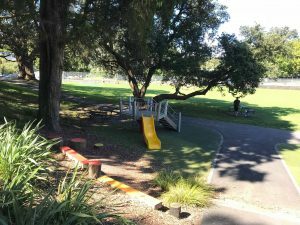 Closest to access the playground are the end of Tahuna Street, Anglesea Street and Smith Streets.